It’s starting to become a tradition for friends and me to visit wineries in the Sierra Foothills on the weekend following Thanksgiving. We were a smaller group this year – my friends Eric, Al, and Jane, plus Jane’s friend Keiko, who was visiting from Japan. Unlike last year, when we focused on just a few wineries from El Dorado County, this time we included a few wineries in Amador County as well. We didn’t have a set plan in mind and decided to wing it for the most part – aside from an appointment at our last stop of the day, we simply dropped in wherever we felt like it. We started out early Saturday morning on a clear but cool day. By the time we headed out of the hills east of Fairfield along Highway 80, we hit an exceptionally strong crosswind that buffeted the car continuously as we crossed the valley. Not until we climbed into the Sierra Foothills did the wind subside. The plus side to the wind was that we were treated to beautifully clear views on several of our stops during the day. After the two-hour drive from the Bay Area, we made our first stop at Convergence Vineyards, between the towns of Ione and Plymouth in Amador County. Named for the convergence of three creeks on the property, the winery and vineyard are a little off the beaten track, outside the main Amador wine area of Shenandoah Valley a few miles away. 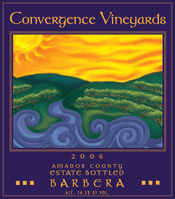 I’d stopped at Convergence several years ago and remembered liking their wines well enough to make a return visit. We pulled into the winery parking area and were immediately met by River, the winery dog. Heading into the small, rustic tasting room, we were greeted by winery owners Stephen and Jamie Concannon – part of well-known winemaking Concannon family but not connected with the eponymous Livermore winery. They bought the property less than ten years ago and established a small estate vineyard, which has been producing fruit for the winery beginning with the 2006 vintage. They now produce close to 70% of the fruit that goes into their wines. Production is quite small, and the wine is sold almost exclusively direct from the winery. Stephen and Jamie were very amiable hosts, and we had a good time with them as we tasted through their wines. We sampled a wide variety of wines at Convergence, from a sparkling wine to Sauvignon Blanc, Mourvèdre, Carignane, Barbera, Tempranillo, and a Petite Sirah Port. There were also a couple of interesting blends (with a new Rhône-style red blend on the way). Standout wines included the exuberant, peppery ‘07 Carignane and the lively and balanced ‘07 Estate Barbera. The lightly grassy ’08 Sauvignon Blanc, smoky ’07 Tempranillo, and the ’07 blend called “The Italian Job” (old-vine Zin plus Cab and Syrah) were also quite nice. Convergence is producing some very solid wines, and it’s worth seeking them out when visiting Amador County wineries. I’d enjoyed a few Runquist wines in the past, notably their Zinfandel, Sangiovese, and Barbera, so when I saw that they had a new tasting room in the area, we decided to make it our next stop. We drove through Plymouth, then headed northeast into Shenandoah Valley where we soon arrived at the Runquist facility, open for less than two years. The bright and airy tasting room has a central tasting bar with plenty of space for lots of tasters on busy days. Jeff Runquist had been the winemaker at several well-known wineries, including J. Lohr and Montevina. He has had his own label for about 15 years, and the annual production is currently around 10-12,000 cases. The fruit for the wines is sourced from vineyards in a number of areas – Clarksburg, Lodi, Paso Robles, Carneros, as well as Amador County. Runquist makes a lot of different varieties, including some more obscure ones such as Souzão, Tannat, and Touriga. Except for the “Z” Zinfandel, the labels are distinguished by the large script “R” on the front. The wines were undeniably well-made, but I found many of them to be more ripe and oaky than I prefer, sometimes speaking to me more of the winemaking than of the grape variety or vineyard location. But they’re clearly crowd-pleasers, and they routinely win lots of major wine competition awards too. Although the Sangiovese and Barbera I’d liked in the past were not being poured, we did taste two Zinfandels along with a Grenache, Cabernet Franc, Cabernet Sauvignon, Syrah, and Petite Sirah. My clear favorite among all the Runquist wines was the '07 “Z” Zinfandel, from Massoni Ranch in Amador County. Made from 80+ year old vines, this had classic wild berry Zin aromas, smooth mouthfeel, and a long flavorful finish – a fine Amador Zin. Our next stop was just a mile or two up the road, at Terre Rouge / Easton. 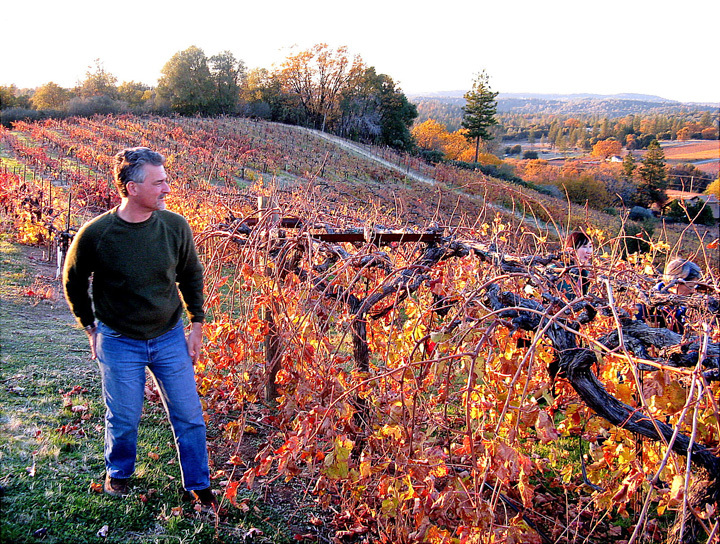 The two labels from winemaker Bill Easton are differentiated by their grape varieties – Terre Rouge works exclusively with Rhône varieties, while Easton produces mainly Sauvignon Blanc, Zinfandel, Barbera, and Cabernet Sauvignon. Most of the wines are produced in fairly small quantities, and we were told that about 85% of the production goes to restaurants, many of them in the Sierra Foothills. As has been my experience in the past, the Terre Rouge / Easton tasting room tends to pour a lot of older vintages, which can be a good thing or a bad thing depending on your point of view (and on the wines being poured). On this visit, we experienced some of both. There was an ’04 Viognier that we all felt was past its prime, and a good but not thrilling ’99 Cab…but there were also a couple of ’02 vintage wines that I thought were drinking very well. The ’02 Easton Fiddletown Zinfandel (from vines as much as 140 years old at Eschen-Rinaldi vineyard) featured briary, peppery boysenberry fruit – the essence of old-vine Zin – while the ’02 Terre Rouge Sierra Foothills Mourvèdre was still a big, tannic wine with years left in it, but beautifully displaying Mourvèdre’s wild side with leather, tobacco, and dark berry aromas and flavors. In addition, we tasted a very pleasant ’07 Easton Sauvignon Blanc, a smooth and tasty ’06 Terre Rouge “Tête-a-Tête” red Rhône-style blend, and a couple of dessert wines. With the mix of old and newer vintages, tasting at Terre Rouge / Easton is always something of an adventure, but there’s usually a hidden gem or two waiting to be discovered, and that was the case this time. After our stop at Terre Rouge / Easton, we headed north from Amador to El Dorado County to visit Holly's Hill Vineyards. The change in scenery is striking, going from the warmer, lower-altitude landscape of grassland and scattered oaks of Amador to the cooler and higher evergreen forests of El Dorado. The sight along the local roads of several alpaca ranches seemed oddly jarring, though! We arrived at Holly’s Hill and walked into the cozy tasting room. As usual, Holly’s Hill co-owner Josh Bendick was behind the tasting bar. It was a busy mid-day with lots of visitors in the room, and to add to the flurry of activity, there was a power outage to deal with – one that we found later in the day had been widespread through much of southern El Dorado County. But Josh and the other pourers seemed to take it all in stride. The tasting room looks out over the scenic hillside estate vineyards, which are planted to Viognier, Grenache Blanc, Roussanne, Grenache, Mourvèdre, Syrah, Counoise, and Petite Sirah. We tasted through the line-up of Rhône-style wines, going through two whites, a Rosé, five reds, and a dessert wine. As always, these showed as some of the better wines coming from El Dorado County. In most of my past visits, I’ve preferred the white wines to the reds, but I found that trend reversed this time, with two red blends in particular being standouts. The ’07 “Patriarche” Mourvèdre-based blend had complex dark berry and meaty aromas along with medium-bodied mouthfeel and fairly big tannins. The ’07 “Tranquille” – which will be known as “Petite Patriarche” beginning with the ’08 vintage – is another blend. The ’06 vintage had been Grenache-based, but the ’07 relies more heavily on Mourvèdre with large doses of Counoise and Grenache as well. The ’07 was full-bodied, with pepper and mineral notes and a delicious long finish. After our tasting, we took advantage of the tables just outside the tasting room for a picnic lunch. The sky was crystal-clear, allowing a view as far as Mount Diablo, over 85 miles to the west. 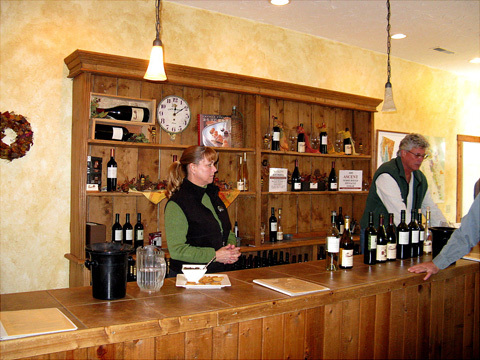 Holly's Hill remains one of the most consistent producers in the Sierra Foothills, and the combination of the fine wines and gorgeous views makes this an easy choice for repeat visits. After lunch we backtracked south to Mount Aukum Winery. Following a narrow side road up and up the slopes, we soon arrived at the winery, nearly at the summit of the mountain. The tasting room takes advantage of the location, and on this clear day the large windows offered a spectacular view far across the Central Valley as the sun began to drop lower in the afternoon sky. 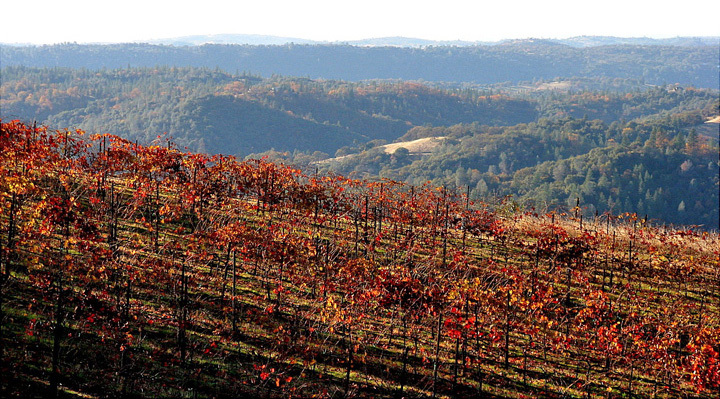 The wooded hills rolled into the distance beyond the winery’s estate vineyard, where they grow Zinfandel, Petite Sirah, Cabernet and Petit Verdot. I’d visited Mount Aukum a couple of times before, but it had been a few years since my last stop there. I learned that they’d had a change in ownership and winemaker in recent years. On my last visit there, I thought that a sharper focus on their best wines might be beneficial, but this time I found an even broader range of wines being poured. We tasted several white Rhône-style whites, a Super Tuscan style blend, a Bordeaux-style blend, plus Zinfandel, Syrah, and Petite Sirah (and they make a red blend of Portuguese varieties as well). Overall, this was a disappointing visit based on the promise this winery had shown in earlier years. I did not find that the wines were up to the level that I’d experienced in the past. I thought the two Petite Sirahs (a regular and reserve) were the best of the wines we tasted, but even these were not really exceptional. Hopefully once the ownership and winemaking situation is more settled, we’ll see some better wines again from Mount Aukum. We still had some time before our one late-afternoon appointment, so we decided to make another stop along the way. After a spirited discussion on where to go, we decided on Perry Creek, in the Fair Play AVA of southern El Dorado County. The winery is located near the heart of the AVA, and close to the small town of Fair Play itself. The winery building is large and elegant, a far cry from the small tasting room in an older building that I recalled from a visit there many years before. We headed inside and settled in at the long tasting bar. Despite a busy tasting room, our pourer was quite attentive. Perry Creek is especially known for its Zinfandel, but we tasted a number of other wines too, including Chardonnay, Syrah, and a Syrah Rosé. The “Zin Man” is the winery’s flagship wine, and the ’06 vintage that we tasted was a lighter-bodied Zinfandel – not very concentrated flavors but bright and peppery, a pleasant value-priced everyday wine. We moved on to Perry Creek’s reserve line of wines called Altitude:2401 – guess there was no longer any point in me asking about the elevation of the winery! The Altitude:2401 Zinfandel, Syrah, and Petite Sirah that we tasted all represented a big step up from the winery’s regular offerings. The bold and spicy ‘06 Zin and the complex and minerally ’06 Syrah in particular were outstanding, among the best wines of the day. I'll be sure not to wait so many years between visits to Perry Creek in the future. Our final stop of the day was our appointment at Cedarville Vineyard, a longtime favorite among Sierra Foothill wineries. Since we had planned to have dinner in the Sierra Foothills before driving back to the Bay Area, we’d checked before our visit with Cedarville owner/winemakers Jonathan Lachs and Susan Marks for dining recommendations. Rather than a list of restaurant suggestions, we were happy to receive an invitation to join them for dinner that evening at their house overlooking their vineyard and winery. Jonathan and Susan grow Viognier, Grenache, Mourvèdre, Syrah, Zinfandel, and Cabernet Sauvignon at their vineyard, and except for their Petite Sirah, they use exclusively estate fruit in their wines. After arriving at their house, Jonathan took us for a brief tour along some of the nearby Syrah vine rows as the air turned chilly and the sun started to dip below the western hills. As he discussed the vines in Cedarville's well-tended vineyard, Jonathan also pointed out distant Pyramid Peak near Lake Tahoe, as well as various El Dorado County vineyards visible from the hilltop. After awhile we were ready to head back into the warmth of the house, and we tasted through the current Cedarville wines – ’08 Viognier, ’07 Grenache, Zinfandel, Syrah, and Petite Sirah, and ’06 Cabernet Sauvignon. The Viognier combined the best aspects of the riper, fruitier ’07 vintage and the leaner, more minerally ’06. Among the reds, the red fruits and spice of the Grenache and the lush yet lively Zin – maybe their best yet – led the way for me, but the other wines were not far behind. As the estate vines gain age, I'm finding that most of Cedarville's wines now show a distinctive touch of minerality that they didn't have as consistently in earlier years. Their wines display elegance and restraint along with ample upfront fruit, and as we found when Jonathan and Susan brought out a couple of older Syrahs at dinner, they can age beautifully as well. 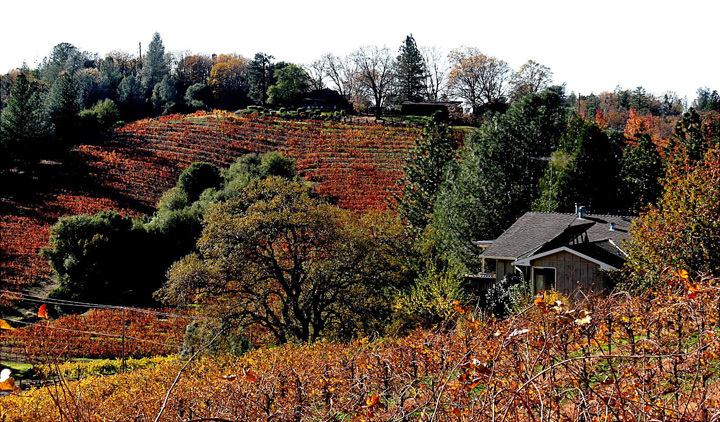 Cedarville remains among the very finest wineries in the Sierra Foothills. We said goodbye to Jonathan and Susan after a relaxing and enjoyable dinner, and made the long drive back home. The wines we tasted during the day were a mixed bag, but there were some surprising standouts from Convergence and Perry Creek, a tasty Zin from Runquist, a couple of very good older wines from Terre Rouge, along with the reliably fine wines from Holly’s Hill and Cedarville. And as usual with the Sierra Foothills, the better wines from the area are outstanding values compared with similar-quality wines from elsewhere in California. As always, thanks to everyone that we visited for being so generous with their time and their wine!